A relentless six-week selling streak has sent the Shanghai composite down 13.9 percent so far this year to its lowest since 2016 and into a bear market. Escalation in trade tensions with the U.S. spurred the latest sell-off, analysts said. But they also point to the overarching trend of Beijing's efforts to deleverage through new regulation while maintaining economic growth by easing monetary policy. An investor watches the electronic board at a stock exchange hall in Hangzhou, China. U.S. stock investors aren't the only ones suffering from anxiety over the Trump administration's trade policies. 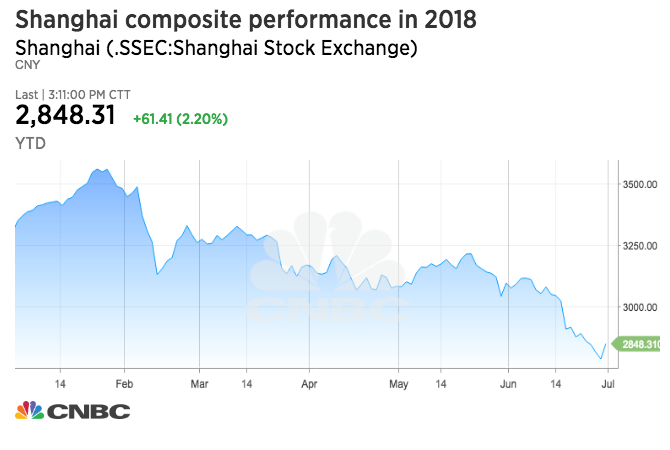 China's Shanghai composite is tracking for its worst year in seven after falling 8 percent in June, amid escalating trade tensions and Beijing's efforts to reduce reliance on high debt levels. A relentless six-week selling streak has sent the mainland's benchmark stock index down 13.9 percent so far this year, to its lowest since 2016 and into a bear market — a more than 20 percent retracement from a recent high. Escalation in trade tensions with the U.S. spurred the latest sell-off, analysts said. But they also point to the overarching trend of Beijing's efforts to deleverage while maintaining economic growth. Neither of those factors are necessarily supportive for the local stock market in the near term. "The sell-off was and is an impact of regulatory tightening," said Lauren Gloudeman, a research analyst with Rhodium Group’s China markets research team. New policies, both recently implemented and forthcoming, limit the scale to which banks can keep riskier items off their balance sheets. A result is that some local non-financial institutions called "trust companies" are exiting their stock holdings, Glouderman said. At the same time, China is easing monetary policy to help support economic growth. The People's Bank of China announced Sunday that for the third time in 2018, it would lower its reserve requirement ratio for banks, improving the ability of businesses to get funding, or liquidity. The cut is set to take place on July 5, one day before U.S. tariffs on $34 billion of Chinese goods are scheduled to take effect as the Trump administration tries to reduce the trade deficit and protect intellectual property rights. Beijing plans to retaliate the same day with its own duties on $34 billion worth of U.S. goods. The Shanghai composite steadied Friday, closing up 2.2 percent. But the index lost 8 percent for June in its worst month since January 2016 when it plunged more than 20 percent on worries of a sharp economic slowdown. "We don't know how much [of] the deleveraging process has yet to take place," Sean Darby, chief global equity strategist at Jefferies, said in a phone interview Monday. "In a way the stock market is a leading indicator on the economy because of liquidity concerns." "Based on history, things are probably slowing down in China now," he said. "So far the international markets have not picked up this slowdown at all."